Nobuhiko Kobayashi, associate professor of electrical engineering in the Jack Baskin School of Engineering at UC Santa Cruz, has been appointed co-director of the Advanced Studies Laboratory (ASL), a collaborative research facility jointly administered by UCSC and the NASA Ames Research Center. 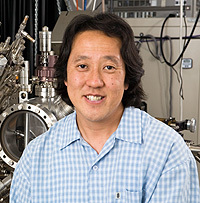 As UCSC co-director (effective October 1, 2009), Kobayashi serves alongside NASA co-director Wenonah Vercouture to guide the development of the ASL's research collaborations, industrial relations, and educational programs. Martin Chemers, vice provost for Silicon Valley Initiatives at UCSC, said Kobayashi is an excellent choice to build the effectiveness of joint ASL administration. "His research in nanoscience and renewable energy applications makes him well-placed to grow our industry relations, he works well with NASA, and he is a major supporter of ASL educational initiatives. I am excited to see the results of his work over the coming year," Chemers said. Based on the NASA Ames campus, ASL provides cooperative working space where affiliated researchers and students from various organizations can work together sharing resources and expertise. ASL collaborations include projects led by the founding partners (NASA Ames and UCSC's Silicon Valley Initiatives), as well as by other academic and nonprofit research institutions and private industry. Kobayashi will work with the Silicon Valley Initiatives, NASA counterparts, and other ASL stakeholders to identify new research collaborations, develop new plans for shared use of the research infrastructure, and continue the process of building the reputation of the ASL. "I am very pleased to have the opportunity to participate in the leadership structure of the UCSC Silicon Valley Initiatives," Kobayashi said. "The ASL provides me with my primary research facilities, so I am eager to give back by serving the broader ASL community as we seek to grow the institution in the interests of all parties."